If you are already a member of this service, please log in here. Two-Step strategy to 99.3% average yearly gains. Here’s how you can multiply your wealth 25 times over with minimum risk. The red line shows you the gains you could made in the S&P from 2012 to 2018. The blue line shows you gains in a conservative, low-risk strategy that beat the S&P 17.5 times over. That’s enough to turn a small $10,000 into $248,516 … after taxes. These aren’t theoretical gains. And, these aren’t back-tested results. These are the real-time gains made by real subscribers using real money over the past 6 years. 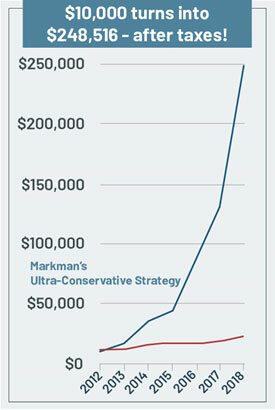 Since 2012, I used a conservative two-step strategy to avoid the riskiest investments. I’ve never lost money in any calendar year for 6 years straight. If you had followed me since 2012, your worst year would have given you gains of 25%. And your best year would have earned you gains of 155%. These are the real-time results my subscribers made over six years. If you bought when I said “buy” and sold when I said “sell”, you would have averaged 99.3% total return over six years. The secret? My conservative Two-Step strategy. Step 1: Find the right companies to invest in. Is the company currently making money? Has it made a profit in at least 7 of the last 8 years? Does it have plenty of cash on hand? Does it have the right level of debt for its size? Have the shareholders gotten a good return on their money? Has the company created any new products or services recently that might increase the value of its stock? Once the computer is done, I’m left with 15 of the safest, most profitable stocks and ETFs. Then, I take the next step. Step 2: Take the 15 best companies and leverage them with the most conservative, highest quality, most liquid options. My strategy takes advantage of options. But I don’t invest in options like 90% of people today. I don’t chase after home runs and pray for a price explosion. And I don’t use complex strategies like “strangles”, “straddles”, or “iron condors”. Instead, I aim for base-hits using only large cap stocks and ETFs. Large cap options give you the best chance of making a profit. It’s easier to buy at the best price and sell for a profit. I also stick to the KISS principle. “Keep it simple, stupid.” I simply recommend call options on stocks that are expected to go up and put options on stocks that are expected to go down. That’s it. I use simple, conservative strategies like these to double your wealth every year. In six years, that’s enough to turn $10,000 into 248,516 … after taxes! Even assuming you’re in the highest federal tax bracket and live in California, the state with the highest income tax in the United States, you still could have turned $10,000 into $248,516. And if you invested using a tax-protect account, your gains would have been even higher. Up to $516,403. Hard to believe? My publisher didn’t. He was incredibly skeptical. But when I showed him my real-time track record, he begged me to share my strategy with you. You don’t need complex option strategies. You don’t need to buy moon-shot stocks. And you don’t need to use insane amounts of leverage. You just a need simple, disciplined trading strategy. That’s what you get with Markman’s Strategic Options trading service. Member benefit #1: My FREE Strategic Options Quick-Start Guide which shows you how to sell and buy options to make MORE money on trades. Member benefit #2: You get daily advice to keep you updated on the progress of our positions, or to adjust our stop-loss or target levels if necessary. The target price to take profits on the second half of your trade. Member benefit #3: My exclusive DAILY market review. First thing in the morning, on EVERY trading day of the year, you get my members-only review of what to expect and what to do. I alert you about up-and-coming opportunities and provide my unbiased comments on breaking market news of the day. Member benefit #4: My Strategic Options website. This is where you can review all my past Trade Alert issues and recommendations or watch my online video briefings — anytime you like. Member benefit #5: My hotline for quick answers to any questions you have about the recommendations I’ve made. Member benefit #6: You’ll meet with me LIVE online for updates and Q&A sessions. I host members-only online events throughout the year. These events are live, so you can ask me anything on markets or the investments I recommend. I also record everything, so you can listen again later, at your convenience. If you don’t double your money in your first year, I’ll pay for you to receive a 2nd year of my Strategic Options FREE. Bottom line … Markman’s Strategic Options has you covered for high-quality options trades that give you the potential for life-changing profits. This service is not for tire-kickers. If you’re at all skeptical, please move along. If the price is too high, this program isn’t for you. 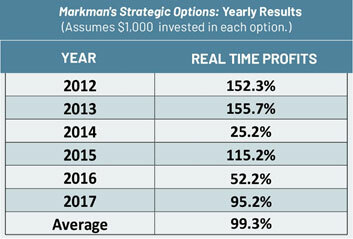 Markman’s Strategic Options is only for serious investors dedicated to doubling their wealth each year. And serious investors know that the key to growing your wealth is discipline. If you want to beat the S&P 500 by 17.5 to 1, just like we’ve done over the past 6 years, I urge you to join us now.